With only a month left to the much anticipated Royal Wedding of Prince Harry & Meghan Markle we present to you Unique Salon's Spring/Summer campaign with a royal fairytale twist. The overall Make Up and Hair Look created is vibrant yet subtle enough for any bride - we have captured the essence of a real bride enjoying her special day! Here at Unique, we believe that every bride deserves to feel Unique. To achieve this, Jatty Kudhail provides a calm and relaxing environment for you from the minute you book your trial to your special day. Jatty Kudhail - Doors are now open! Here's a few memorable moments of our 1st weeks launch back in November 2016. I want to thank my amazing family, friends and team for all the excellent support throughout this event and move. A salon owner who started one of the first Asian salons in Burton 15 years ago is celebrating a relaunch at a new site with business booming. Jatty Kudhail, 43, first started Unique, in All Saints Road, in Burton, before moving to Borough Road in the town. Now, after her business has gone from strength-to-strength, she is celebrating owning her very own site, in Moor Street. The mother-of-three, said: "I started the journey as a bit of a hobby and it was quite a casual thing so I am so shocked at how much it has grown. "I wanted to bridge a cultural gap in Burton's beauty market and I am so glad I did it. I have met so many amazing people in the community by doing what I do, now they have become my friends. 54 Moor St, Burton-on-Trent, Staffordshire, DE14 3SZ (opposite the Toyota garage previously known as Halo). We love to hear from our customers so please let us know your thoughts on our services. UNIQUE'S 2016 CAMPAIGN COMING SOON! We are delighted to announce Arshina Trivedi (Beautiful model and dancer best known for starring in the popular TV series Desi Rascals) as Unique's face of 2016. Working closely with Jatty to promote UNIQUE's brand new looks. Here's a glimpse of our first meeting with Arshina (also our team on set) and photographer Peter Crane (who has photographed a wealth of celebrities such as Kate Moss, George Clooney, Keira Knightly, Jude Law and Sienna Miller). Bridging the cultural divide article - Edited by Gemma Needham from Burton Mail - 2001. Read about Jatty Kudhail and how she started her small business. It touches on her dreams and career aspirations and how she's made her own mark within the beauty market in Burton. NEWLY - established businesswomen Jatty Kudhail aims to bridge the cultural gap in Burton's beauty market with her new 'Unique' store. For Asian women of Burton and South Derbyshire a gap in the beauty market which has meant travelling to Birmingham or Derby for products has been filled since her opening on Saturday. The ambitious entrepreneur hopes her beauty treatments and self-styled products will prove a big hit in the town, not just with Asian women but with English women young and old. Drawing influences from the London beauty scene, 10 years of fashion retail experience and one year of mobile beauty work, Jatty also wants to entice young party-goers with her pampering services - perfect for night out on the town. Until now Asian women from Burton and South Derbyshire area have had to travel to Birmingham or Derby for genuine Indian accessories and beauty services. But Unique Bridal and Beauty Services, which opened on Saturday in All Saints Road, offers handmade accessories and stock direct from India. Fully trained in hair and beauty skills, Jatty's services include threading, bleaching, waxing, facials, and make-up. Specialist tailor-made services also include bridal day make-up, hair design, party or evening make-up, accessories and Henna tattoos. "The name Unique says it all because this is a completely different service that has never been done in Burton before. "At the moment I am specialising in Asian beauty and bridal makeovers but I have also done English brides and a lot of my services relate just as well to the English Market. "I am Sikh but I am very English and come from a modern background. I want to be able to branch out and offer Burton women something special that they can't find anywhere else. "I have had a lot of feedback from friends and clients and the general feeling is that people are having to travel further afield because there is nothing available locally. I want to fill that gap, and offer much more besides," she said. Her ultimate aim is to open a second shop closer to the town centre and expand the services to Burton's women. For further information is available by telephoning 01283 532218. 1) DO YOU REMEMBER THE OLD SALON AND DO YOU STILL COME TO US? 2) WHAT ARE YOUR FAVOURITE TREATMENTS AT THE SALON? AND WHY? 3) IF YOU ARE A NEW CUSTOMER HOW DID YOU HEAR OF UNIQUE AND OUR SERVICES? WE WOULD LOVE TO HEAR FROM YOU ALL, please leave your comments below. Unique is about YOU. Whether it’s your first bridal consultation or a simple relaxing spa treatment, our goal is to make you look and feel beautiful. Unique first opened its salon doors in 1999 as the first asian salon in Burton-upon-Trent. Owner Jatty Kudhail started the business as a part-time venture following her strong interest in the make-up and beauty industry. She spent many years perfecting her talents and exploring various opportunities that would eventually open up doors for her to expand her skills. Jatty’s desire has always been to showcase her creative talents to a much larger audience and on 25th January 2015, UNIQUE came to Asian Bride Live LONDON and BIRMINGHAM on 15th March 2015 to do just that! It can only be said that she captivated her audience and won praise for her great work and skill. 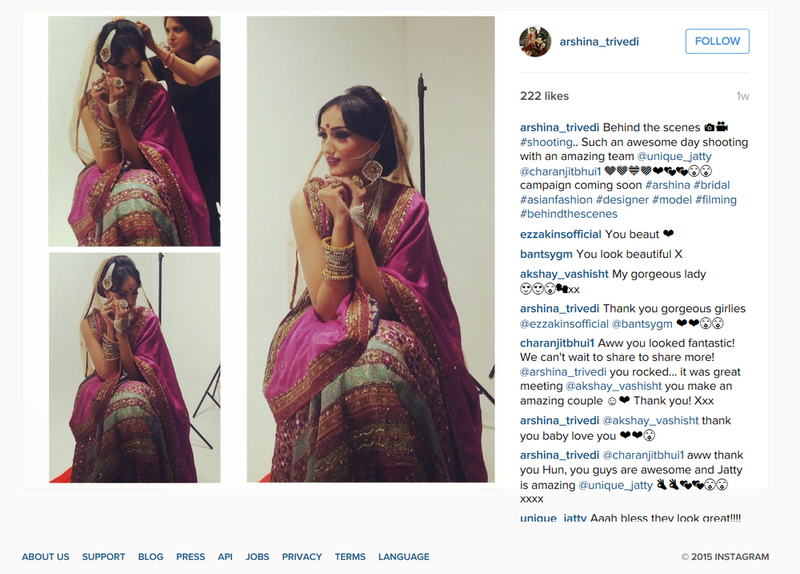 Unique appeared in the latest (Spring/Summer) edition of Asian Bride magazine 2015. Review our highlights below. "I consider myself a true artist of my profession with my signature looks all being diverse. I have the ability of knowing what looks and current trends work for the events they are required for. This summer’s look concentrates on bright striking eyes, with the blending in of strong bold colours to capture the innocence of being a bride with great beauty and glamour!" Wedding reception services and parties • Modelling catwalks • Mehndi and nail art • Hairdressing • Spa and body treatments • Toning and firming treatments. Professional SuperCover make-up and we sell the revolutionary ItWorks tightening body wraps.